SCP is currently running their September auction, and it includes a couple of really nice Dodger related items. Above is an original drawing from Willard Mullin that is entitled "Wait Till October." 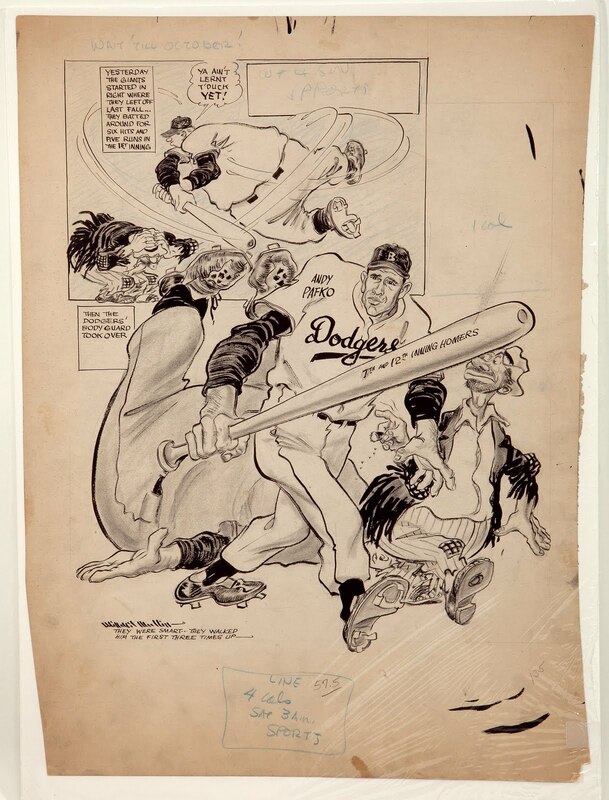 It was drawn after a Friday game at Ebbets Field on April 18, 1952. 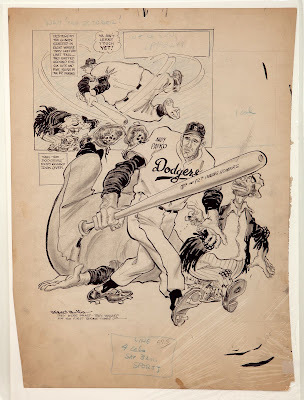 It was the just the fourth game of the young season as the Dodgers faced the sitting pennant winners, the New York Giants. "Yesterday, the Giants started in right where they left off last fall... they batted around for six hits and five runs in the 1st inning." Not a great start for our Brooklyn boys, but have no fear. The Dodger bats would not go silent all game long. "Then the Dodgers' bodyguard took over." Who's that you ask? Who's the bodyguard? Well, it was #6 hitter Andy Pafko. He would go on to hit a home run in the 7th inning, then finish it off in classic fashion with a walk-off home run in the bottom of the 12th inning. That would give him his 3rd home run of the young season, and give the Dodgers a well deserved victory over their hated rivals. What makes this even sweeter is that the Dodgers would end up winning the pennant that season as the Giants ending up 4.5 games back in 2nd place. "Wait Till October," indeed. 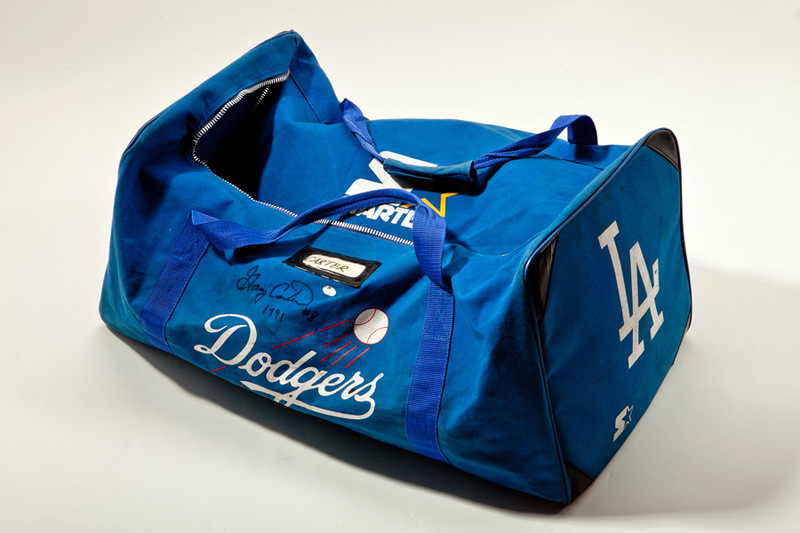 Below is the personal equipment bag that once belonged to Hall of Famer Gary Carter when he donned Blue in 1991. Twitter really has changed how news is distributed. Via the Dodgers twitter account they announce that Andre Ethier has finally decided to take a seat due to his ailing knee. It is not expected that he will come back for the remainder of the season. Surgery, no doubt, is in his future. 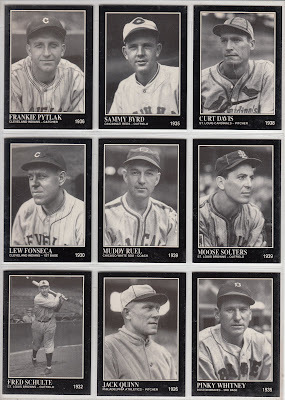 Here are todays Daily Conlon cards numbered 280 through 288, and it features former Dodger Curt Davis- on the top row, far right. Click on any pic to embiggen. Davis didn't get his chance to play in the Majors until he was 30 years old, but still was able to have a long career in the show. He played for 4 different clubs over 13 season. The key to his longevity was that he averaged less than 2 walks every 9 innings over his career. Curt Davis joined the Brooklyn Dodgers as a 36 year old in 1940 and went on to win 66 games for them over 7 season. 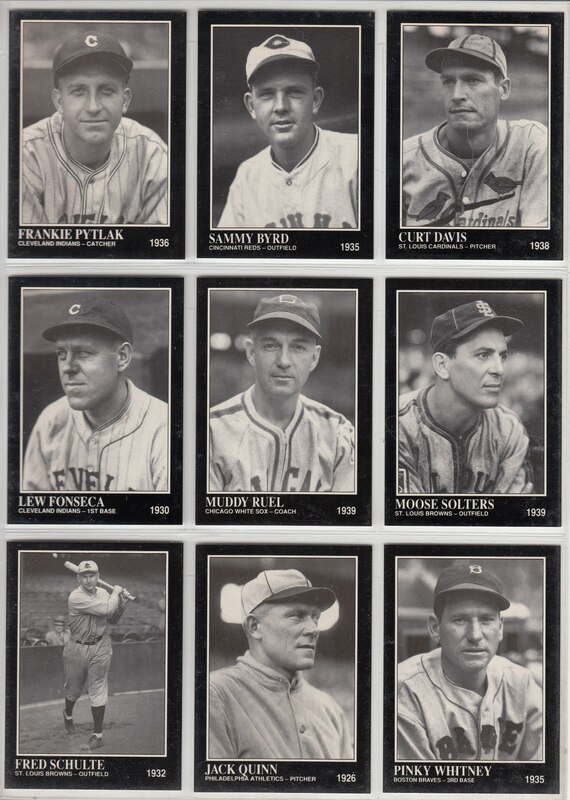 In 1946, at the age of 42, he pitched in just one game (his last in the Majors) and was sent back down for good to Montreal. There, he would be a teammate of Jackie Robinson. Juan Uribe to have surgery, as well. Via Steve Dilbeck of LA Times. 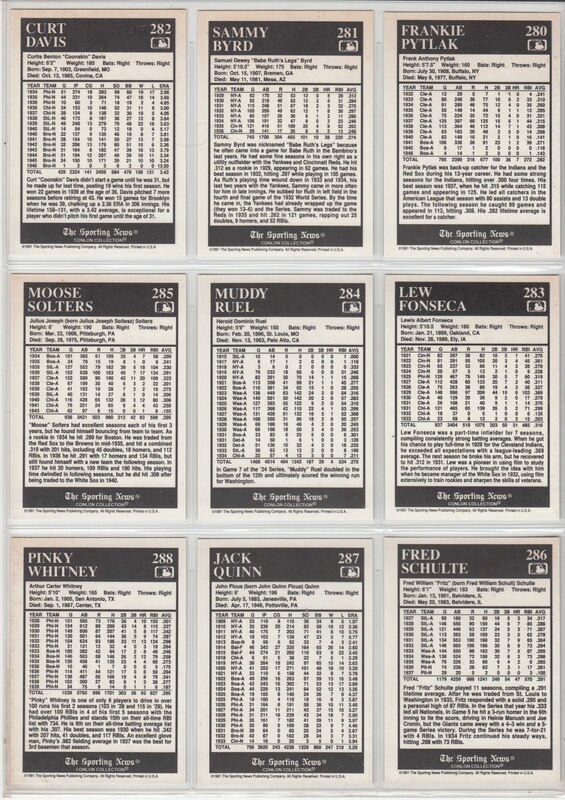 Bob Lemke makes some alternative versions of Sandy Koufax's 1955 rookie card. Jim Rosenthal of Los Angeles Magazine interviews Don Mattingley. 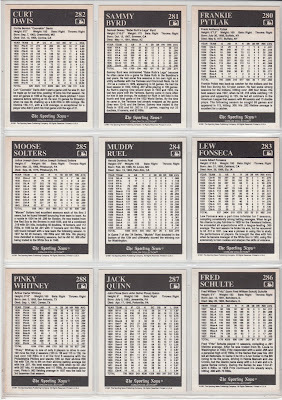 Koufax's Perfect Game- the Tale of the Data, via Frederick Cohan at LA Times. Mike Silva's New York Baseball Digest has a couple of Greg Maddux's high school scouting reports. Via Jon Weisman at Dodger Thoughts, he shares a link from the Department of the Treasury where Clayton Kershaw and Ted Lilly took a tour of the Bureau of Engraving and Printing. Mark's Ephemera shares a 1914 article he found that compares the stats for drinking and non-drinking ballplayers. 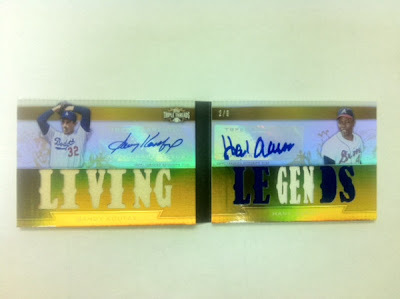 Adrian Beltre- a Hall of Famer? Rob Neyer ponders that a bit at SB Nation. "The league's view is that the Dodgers needs to be owned by somebody who has the wherewithal to own the team and to properly capitalize it," says Thomas Lauria, partner at White & Case.